The Great North Railway's (GNR) Class J14 (LNER Class J53), was Stirling's last saddle tank design and appeared in 1892. Designed for exchanging traffic with the London Chatham & Dover Railway (LC&DR) at Ludgate Hill, the J14 resembled his earlier saddle tank classes but with a boiler that was 5in longer. Although the new boiler was not interchangeable with any existing GNR design, the extra length was deemed essential to increase the steaming capacity and adhesive weight of the locomotive. Both of these factors were considered important for the intended duty that included the steep bank at Ludgate Hill. The J14s continued the Stirling tradition of having a domeless boiler. After the first few engines were built, the cylinder diameter was increased from 17.5in to 18in to give an increased power output. A total of 52 J14s were built between 1892 and 1897, with twenty built by Neilson & Co. and the remainder built at Doncaster. Seventeen J14s including the first six, were built with condensing gear for operating over the Metropolitan Widened Lines. Ten J14s had condensing gear retro-fitted in 1900. The condensing gear was often removed when the J14s were allocated away from the Metropolitan Widened Lines. In 1912 some of the J14s had the gear removed when they moved to Leeds and Doncaster. 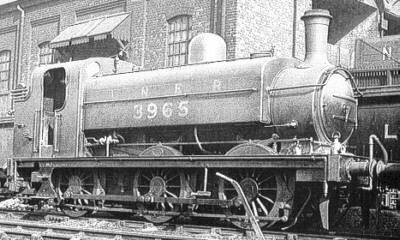 Although condensing gear would continue to be removed during both GNR and LNER ownership, it appears likely that some were scrapped with the condensing gear intact. In 1897, Ivatt introduced a version of the J14 with a domed boiler, and this became GNR Class J13 (LNER J52). The new boiler was of the same length (10ft 6in) as that of the J14 boiler, but had a greater diameter (4ft 5in). A total of 85 J13s were built between 1897 and 1909. Although the two classes were virtually the same except for the boilers, none of the J14s were rebuilt with the larger domed boilers until 1922 when three were rebuilt as J13s. The rebuild process continued after Grouping (1923), with the last J53 (ex-J14) being rebuilt in November 1932. Both classes were initially fitted with plain cast iron chimneys 3ft 5in high. Although these were low enough to fit within the Metropolitan Railway's height restrictions, they were gradually replaced with slightly shorter (3ft 3in) chimneys of a similar design. Other chimney types have been recorded. After 1923, the J53s with condensing gear were fitted with 2ft 11.5in chimneys. The J52s with condensing gear were fitted with a slight shorter (2ft 10in) chimney instead. In 1925, five J53s were rebuilt with boilers taken from withdrawn G2 0-4-4T locomotives. These boilers had to be lengthened to fit the J53. Four of these were rebuilt as J52s between 1928 and 1932, and the fifth (No. 3928) was withdrawn in November 1935. All of the locomotives with condensing gear were fitted with extra lamp irons, enabling Southern Railway (SR) headcodes to be displayed during their transfer trips to South London. In 1940, the J52 class was divided into two sub-classes. 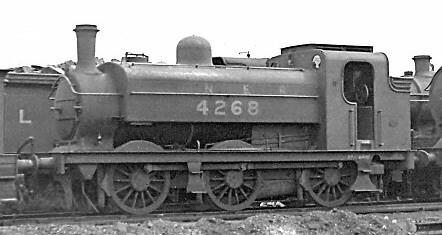 Class J52/1 was used for the rebuilds from class J53, while Class J52/2 was used for the original domed locomotives. Intended primarily for shunting duties, the J52s and J53s were mainly allocated to large marshalling yards. By Grouping (1923), they were allocated to Kings Cross (28), Hornsey (24) New England (21), Doncaster (28), Ardsley (14), Bradford (14), Colwick (6), Grantham (1), Lincoln (1), and Manchester (4). With the introduction of further J50s immediately after Grouping, the West Riding locomotives moved to Hornsey and Colwick. The J52 and J53 saddletanks were a common sight in Northern London. As well as shunting at Kings Cross, they worked the incline at Maiden Lane up to the North London line. They were also a familiar sight at Finsbury Park, Hornsey, Ferme Park, and New England. Withdrawals of the J52s started in 1936 but were halted at the outbreak of war in 1939. 132 (+1 departmental) J52s would remain in service until after Nationalisation (1948) when withdrawals re-commenced in 1950 with the arrival of large numbers of diesel shunters. Withdrawals were completed by 1961. Cylinders (x2): (inside) 18x26in. 18x26in. Heating Surface: Total: 1164 sq.ft. 892 sq.ft. Firebox: 103 sq.ft. 83 sq.ft. Grate Area: 16.25 sq.ft. 16 sq.ft. J52 No. 68846 (GNR No. 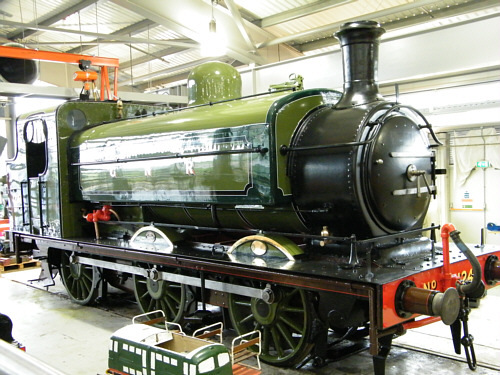 1247) has been preserved in the National Collection, and is currently on static display at the Shildon 'Locomotion'. Hornby produce a OO gauge ready-to-run model of the J52. Dave Cleal at Mainly Trains has produced a chassis kit and body modification kit for the Hornby J52, to bring it closer to scale. A kit of all the parts required to build a complete 4mm scale (OO, EM, and P4) model is also available. BEC Models produce a 4mm scale white metal bodyline kit that will fit the Mainly Trains kit, or a TriAng Jinty chassis. Walsworth Models produce a kit for the J52 for both 4mm and 7mm scales. ACE Products sell a kit of the J52 for 7mm scale (O gauge). I am not aware of any models of the J53, although some of the J52 kits can probably be modified to make a J53. Thank you to Malcolm Peirson for the photograph of J53 No. 3965. Thank you to the Mike Morant Collection for the photograph of J52/2 No. 4268 at Colwick in July 1938. Thank you to Robert Langham for the photograph of the preserved No. 1247.